The short answer is Yes, but not necessarily because DeX is 'better' than Continuum per se - it's more to do with the hardware powering the phone... as I'll explain. a Lumia 950/XL or HP Elite x3 or Alcatel IDOL 4 Pro/4S handset running Windows 10 Mobile OR a Samsung Galaxy flagship with DeX support built-in. a charging dock with extra ports. I've been using Microsoft's 'Display Dock', with Type C input, Type C charging, twin USB-A ports and HDMI out, but Samsung's DeX dock is pretty similar and both can be used interchangeably, thanks to the compatibility built into USB Type C generally. a 1080p (or better) TV or monitor - I've been experimenting with 720p TVs and there's just too much downscaling and 'jaggies'. Connected by a HDMI cable. Now, you can strip this list right back if you must, using Bluetooth mouse and Bluetooth keyboard, or even using the phone display as your trackpad and input device, but in my experience an all-wired solution is best, with nothing to pair or set-up or micro-manage. The idea is that you plug in the Type C cable and you're done. You can do without the dock too, if you must, i.e. plugging the phone straight into the TV with a Type C to HDMI adapter, though you've then got the phone powering everything and driven quite hard, so you'll be losing battery power fairly quickly. Much better to have the dock in the way, powering the HDMI and accessories, and also charging the phone at the same time. The takeway is that the more you can have set-up, for example as part of a home or remote office that you arrive at and just plug in, the better. What about taking Continuum or DeX on the road? In other words, a way of amplifying your phone screen and capabilities easily, but in an all-in-one 'laptop shell'? That's a cool geek concept and worked fairly well (if with some bugs) with HP's dock back in 2016, but that ended up prohibitively expensive and other third party docks have yet to arrive on the market, despite numerous show teasers and one significant pre-order (see below). 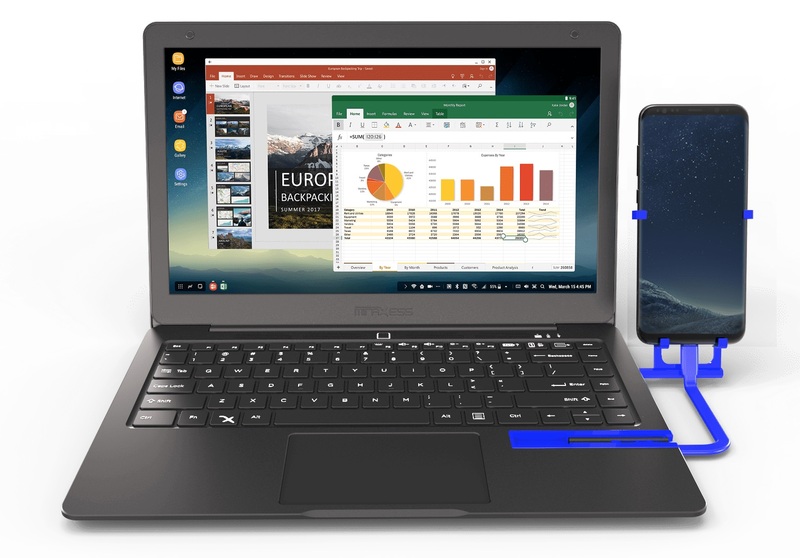 It's not hard to understand the failure of the 'lapdock' in the mainstream market - as the usual objection to fiddling around with Continuum or DeX at all is 'just take a laptop with you'. This could well work out cheaper and is certainly simpler in terms of 'everything just works' rather than 'most things work if you're patient', as is still the case with Continuum and DeX. But the 'use a laptop' brigade kind of miss the point - this isn't about replacing laptops, but giving your smartphone extra flexibility. And after all, your phone has you signed into everything, has biometrics built-in, has mobile data as standard, it has applications for all your commonly used services without needing to use a web browser, and so on. 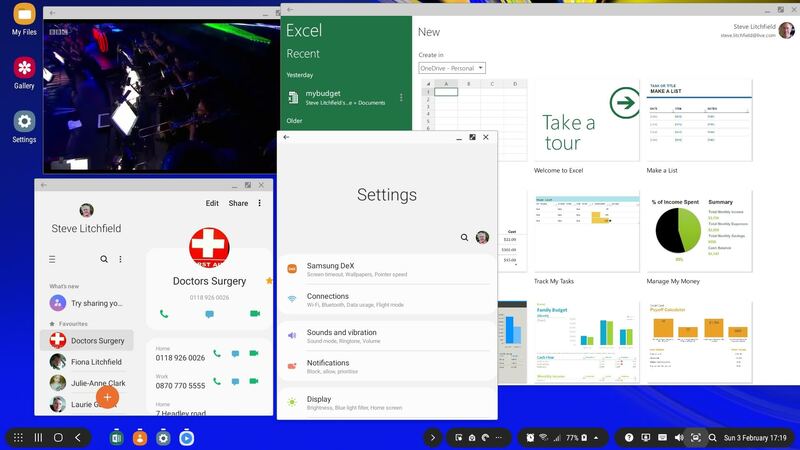 So I maintain that there's a use case for Continuum and DeX (and there are others, Huawei has been trying something similar), despite the ne'ersayers. Display use All applications run full-screen, with a multitasking interface letting you switch between running apps. Exactly what use each application makes of all the extra space varies according to what the developer has implemented. 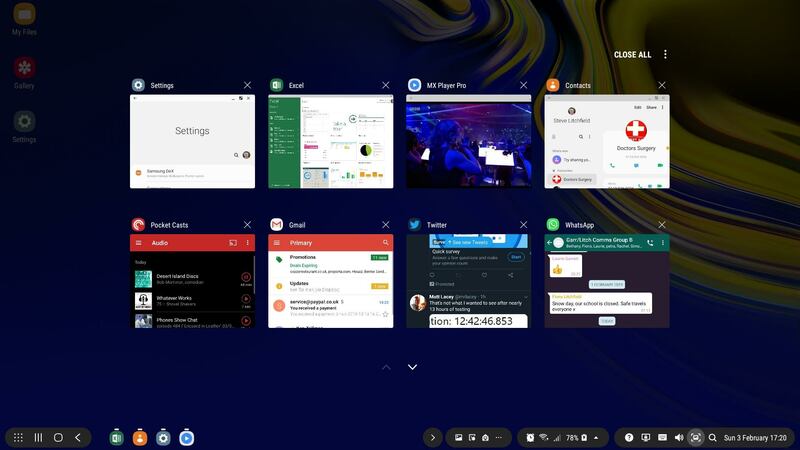 DeX is a windowing environment, meaning that applications can be on-screen simultaneously, moved on top of each other, in theory maximised and minimised. In practice, the exact behaviour depends on the application and whether it's coded to work with DeX or not, and how well. Application compatibility Very good, all UWP apps (including all the Microsoft built-ins, e.g. Outlook and Office) work full-screen and many do interesting things with the layout. Installed Windows Phone 8.1 applications (which still work under Windows 10 Mobile) have their titles greyed out in the applications list and don't run under Continuum at all. Most of the Samsung first party Android apps work fine, with re-sizeable windows, plus many popular third party apps do the same, especially if from larger developers like Google or Microsoft. Most other Android applications installed on the phone are shown in the launcher and can be (re)launched in a 'virtual phone'-sized window, i.e. you do get to use them, just not at Desktop scale. A much smaller proportion of apps don't run under DeX at all, giving a warning message. Right click mouse behaviour Part of a 'Desktop' experience is being able to do context-appropriate things with a right click on a connected mouse. Just think about your own laptop/desktop use. 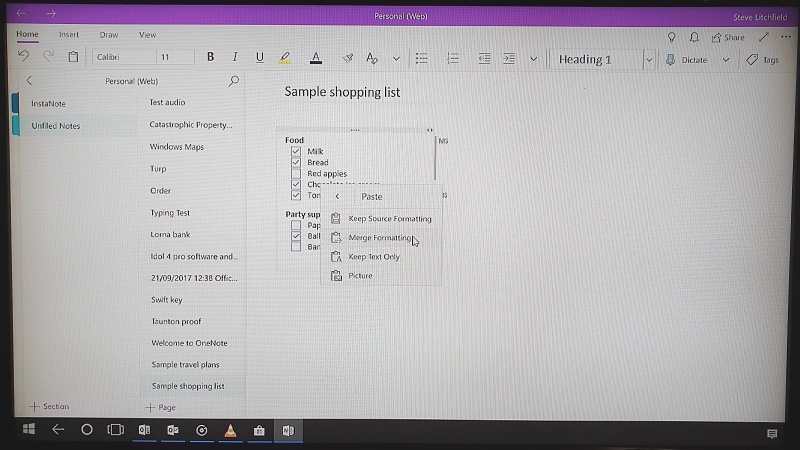 UWP applications under Continuum behave just as they would when on a Windows laptop, on the whole, with a right mouse click bringing up the same pop-up options. Behaviour under DeX is erratic. Some applications (coded with DeX in mind, presumably) pop up a proper context-sensitive menu. Some pop up a menu on a long press of the left mouse button and ignore the right one. Some treat a long press of the left button as a tap and hold in the normal phone UI, for example starting a selection process.or popping up clipboard options. It all depends. Audio handling All phone/app audio is routed to the connected TV/monitor system, which works out well for media apps like Netflix and YouTube clients. By default, all audio stays on the phone, but there's a switch you can throw in Settings within the DeX environment that, thereafter, routes audio through to the connected TV/monitor system. It works well, but it's odd that it's not there as a default. A scan of the table above would seem to give Continuum the upper hand - native UWP applications carring on running seamlessly compared to apps being relaunched under an effectively separate Desktop experience, mouse right clicks are handled consistently, audio comes through automatically, and so on. And it's true, in terms of computer science - underdeveloped though it is (for example, Microsoft had always planned on introducing better windowing), Continuum is still the more elegant implementation, it's the way a desktop extension system should work. 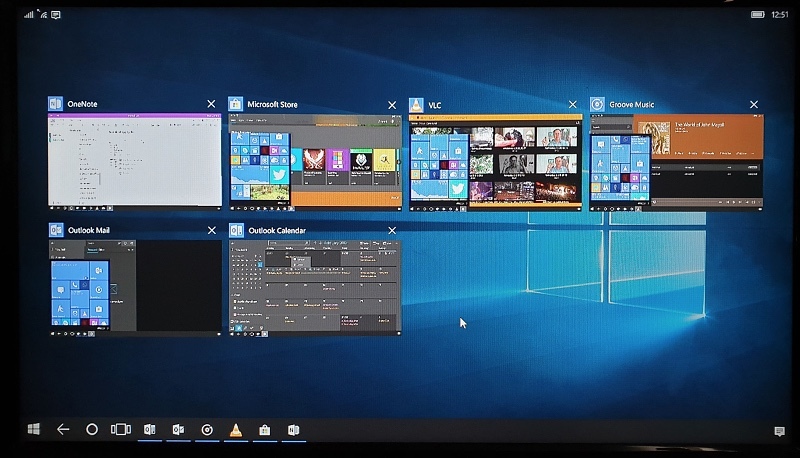 The multitasking view in a typical Continuum session - and yes, the thumbnails here strangely often include the Start menu - just one of a number of longstanding glitches! 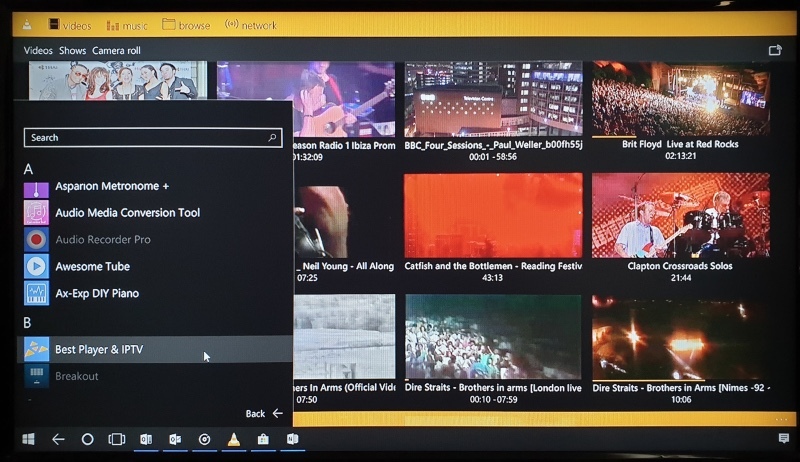 Playing video media through the third party VLC UWP app and with the Start screen's apps list popped up - note that old WP8.1 apps and games are greyed out - Continuum is UWP and Windows 10 only! However, Continuum - even on the Snapdragon 820-powered IDOL 4 Pro here - always feels sluggish - there's very much a sense that a 'phone' processor is trying to drive a desktop experience, so there's lag and delays at every turn. Not unusably so, but let's just say that it never feels fast. Certainly not as fast as an equivalent Windows laptop from the last couple of years with SSD inside. In contrast, the Samsung flagships have the huge advantage of being newer, with the Note 9 tested here having a very new Exynos chip (or a Snapdragon 845 in the USA, which gives an idea as to the relative recency compared to the 820 chip in the Windows phone). Benchmarks show that the Note 9 should be between two and three times as fast as my IDOL 4 Pro, but the latter is also hampered by Windows 10 Mobile itself not being renowned for speed (unlike its predecessor, Windows Phone 8.x), plus the Note 9 has more RAM, faster GPU, and a faster internal storage chip. Add it all together and the responsiveness and general speed of the DeX experience is an order of magnitude greater than Continuum. A typical DeX desktop, showing multiple windowed applications running, including Excel and the Samsung DeX Settings addition, which includes a somewhat hidden setting to enable audio passthrough to the TV/monitor, so that my video playback (playing, top left) has its sound from the display's relatively big speakers. Note that all the apps here are written to be DeX compatible and so can be maximised and minimised as needed. The multitasking view in DeX, you can scroll down to more thumbnails, of course. Notice the very Desktop-like bottom-of-screen controls and indicators - there's a lot packed in. Which levels the playing field, at the very least. The DeX experience is inconsistent, erratic, still under development, and so on. But once you get going, it's just as usable as Continuum, thanks to the raw speed at which it's being driven. Given that Continuum had at least a couple of years head start, you'd have hoped that Microsoft would have developed and optimised things by now - but of course it pulled out of hardware development in terms of phones to drive it, so.... In fact, Continuum has arguably slipped backwards, in that some Microsoft first party applications are becoming less optimised, not more. For example, the Store, which is a giant-fonted abomination under Continuum from Windows 10 Mobile. But if I had to grade the experience with each system, as at February 2019, I'd put W10M and Continuum at 70% and Android/DeX at 75%. And neither of those percentages are anywhere near high enough. It seems that even DeX is something of an experiment, even to a company with Samsung's resources and in light of the Note 9 still being a 'new' device. At $299 it's not dirt cheap, but it's also not out of reach (as the Elite x3 Lapdock was). The Mirabook folk say that things are now on track (after a funding delay) for assembly in April and availability this summer. Yes, it's (very) late, but it's just about the only product of its type and it beats me why we haven't seen others - maybe you can suggest something in the comments? The idea then would be to have this lightweight laptop-lite in your briefcase or car glove-box and then when, on the move, you need a full desktop and more screen real estate then you plug in and you're done. With either Continuum or DeX (or similar). Both systems have such potential, it's a crying shame that there's relatively little progress on either the software or hardware front. If Continuum and DeX were better, up in the 90% region by my reckoning, would it make a difference? Would users start demanding lapdocks and plug-in workstations? Your comments welcome. What about you? What about your co-workers or employees?